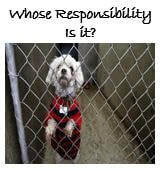 ​Whose Responsibility is it to make sure that the dog you are adopting is right for your family? ​ Strange to think that we often pay more attention to a car we are about to buy than to bringing a living animal with teeth into our homes! Some realities most people will not like about surrendering their dogs. Introducing a shelter dog to existing dogs in the home.